Norbert Reithofer: "Our new modular engine is not in regular use yet. When it comes to efficiency, we are again taking a significant leap forward [in emission reductions]." BMW faces a huge financial challenge to meet tougher CO2 emissions limits that take effect in Europe in 2021. CEO Norbert Reithofer says the cost to comply will be in the billions. He is confident, however, that a new engine family will allow the automaker to meet its EU CO2 target and will also put it ahead of the competition. Reithofer, 58, also says that BMW is re-thinking how to stay ahead of Audi and Mercedes-Benz as the sales battle between the three premium brands heats up. He was interviewed by Pia Krix, a reporter at Automotive News Europe sister publication Automobilwoche. 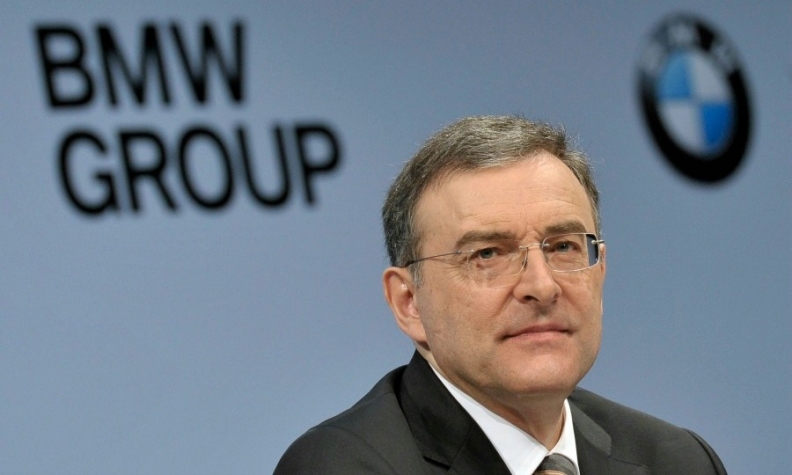 How will tougher EU CO2 emission targets affect BMW’s profits? It will cost us a lot of money to comply with the all the requirements relating to CO2 worldwide. Since 1995, we have reduced our CO2 emissions by more than 30 percent and are now at 133 grams per kilometer. But the last 33 grams will be the most expensive. The figure of 100g/km of CO2 corresponds to an average fleet consumption of about 4 liters per 100 kilometers. We are not talking about sums in the three-figure millions of euros. We’re talking about billions. Are the French hurting themselves by supporting tough EU CO2 regulations that force German premium brands to expand into the small car segment? That is precisely the case. This forces premium automakers down into the small-car segment. And if the regulation continues -- let’s say to the 70g/km that the EU Parliament has mentioned -- other companies will no longer be as competitive with their conventional technologies, to put it mildly. MAIN CHALLENGE: Determining when it no longer makes financial sense to remain the world's No. 1 premium carmaker. The significant advantage in CO2 you once had because of your Efficient Dynamics fuel-saving systems has diminished. What happened? Our new modular engine is not in regular use yet. It consists of new three-, four- and six-cylinder powertrains and is being rolled out gradually. When it comes to efficiency, we are again taking a significant leap forward. Will Mercedes pull ahead of Audi and BMW? We shouldn’t kid ourselves as we look ahead to 2020. Daimler has to meet the EU targets, just as we do, or we’ll pay penalties -- and we don’t want to do that. Audi wants to be the world’s top premium manufacturer by unit sales, Mercedes wants to retake that position and you want to defend it. Are sales figures really the right indicator for a premium automaker? We have been at the summit of the premium segment for 10 years. When it comes to volume, we are now actually involved in a thought process. BMW now holds a global market share between 2 and 3 percent. In Germany, the three premium automakers now have a share of about 30 percent. The competition could hardly be any more intense. That is why we did without the sale of a few thousand vehicles in Germany last year. What about elsewhere in Europe? When it comes to markets such as France and Spain, you also have to consider to what extent you want to take part in the intense competition or come to the conclusion that it is no longer a good fit for us. That means BMW would rather sell one fewer car in Europe and sell one more in China? Yes. At the same time, it depends on the individual markets. The price level in Europe and Germany continues to be good. Shouldn’t the goal be to catch up with Audi on operating margin instead of staying ahead in volume? We naturally pay attention to rates of return. For the first quarter in the automotive segment, we achieved an operating margin of 9.5 percent and thus we are in the upper half of our target yield corridor of 8 percent to 10 percent. But comparisons of rates of return are difficult since an individual subsidiary cannot be compared with an entire company. Next year BMW will be 100 years old and your contract will expire. Is this kind of anniversary an opportunity for the company to set new goals? That isn’t necessary. We have our Strategy Number ONE, which extends into 2020 and is fine-tuned once a year. The world is turning faster and faster. That is why our leadership team meets once a year at a two-day strategy retreat. We like to invite specialists as well. Once it was a quantum physicist. We wanted him to tell us what was heading our way over the next 20 years, especially in basic research. For example, what changes will quantum computers bring? It is still impossible to foresee which storage technology will prevail in 2025 and beyond. This heavily depends on how battery ranges develop. We have to be broadly positioned in our technologies. That’s why we must not turn our back on fuel cell technology, which we are jointly developing with Toyota. Toyota CEO Akio Toyoda says he doesn’t believe in the electric car. He believes in fuel cells. I don’t want to go into detail right now, but perhaps Toyota has now begun thinking a bit differently about electric mobility, and maybe the BMW i3 has triggered a change. What is BMW learning from its partnership with Toyota and what can Toyota learning from BMW? Toyota is one of the leading manufacturers of fuel cell technologies. It is on the brink of introducing production fuel-cell vehicles. I would say that we have built up in-depth expertise in battery-driven EVs in the past five years, and we are also on the right track in lightweight construction technologies. Furthermore, we are already supplying Toyota with our efficient diesel engines for Europe. The BMW i3 and i8 rely heavily on carbon fiber reinforced plastic. Will this material be used more often throughout the BMW range? Yes, but the segment pricing will determine whether and how much carbon we use. With smaller vehicles we have to approach the matter differently than with the 5 series or the 7 series. You have announced that you are tripling carbon fiber production in your joint venture U.S. plant. Is this just for i models and the 7 series? For these vehicles, but also for other BMW models in the future. You build 100 i3s a day in Leipzig. Is that peak production? Right now it is 100 on average, some days a bit more. We are gradually ramping up production and in our mind we have a clear goal that we want to reach. But registration figures are still low. Since we’re dealing with a new technology, we have deliberately chosen a flat ramp-up curve. Moreover, a significant portion of the vehicles built so far have been required for exhibitions and test drives. The sales figures will likely keep growing in the coming months with the vehicle’s increasing availability. Does that mean production is not keeping up? Yes, in some cases, the customers have waiting periods of six months -- which is very long and demonstrates the appeal of the vehicle. And at the same time, we are just getting started with the i3 in the United States. Is it true that the annual production of the i8 is already sold out? That’s right. With this car, our customers need to be patient. We had no comparable measure at all in our sales planning. The i8 is a vehicle that -- like the Z8 a few years ago -- is not designed for large volumes. Instead, we’re talking about a few thousand units.